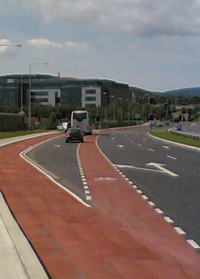 This section deals with one of the principal cycling hazards – the conflict between cyclists travelling straight ahead on the main road and traffic cutting across them to turn left. For left turns from a side road onto a main road, see Side Roads. 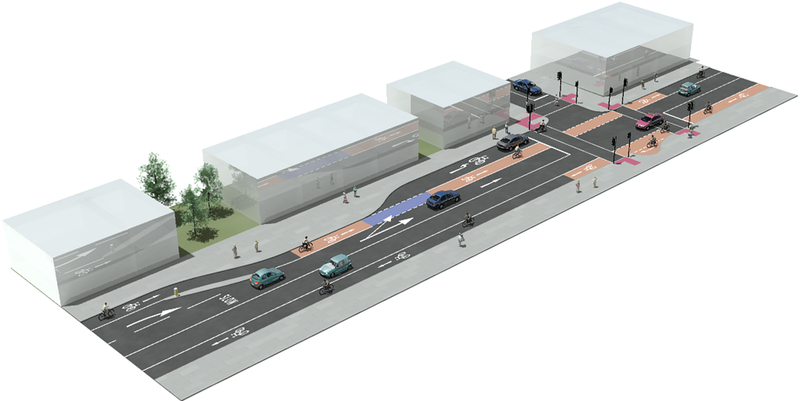 This manual recommends that cycle facilities are re-established as on-road cycle lanes for the last 20 to 30m in advance of a significant left turn. The re-establishment zone provides time for vehicles and cyclists to observe each other and accommodate each other’s movements at the conflict point. This is as much to do with ensuring the safety of straight ahead cyclists as left turning cyclists. 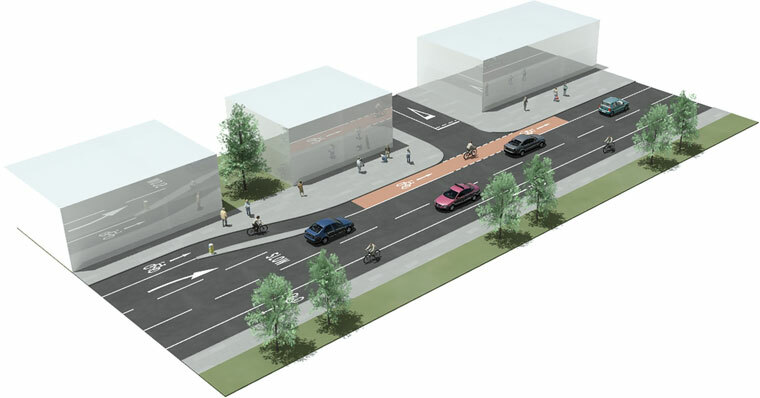 Depending on the nature of the cycle facility along the main carriageway, a Vertical Transition will be required in the case of a cycle track to bring the facility to the main carriageway level. 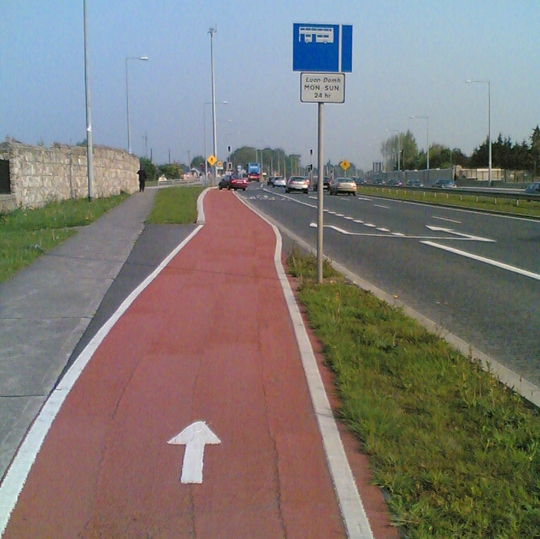 Equally, a Horizontal Transition, shifting cyclists to the right, may be required for an off-road cycle track or if there is kerbside parking or loading facilities in advance of a dedicated left lane or pocket. The re-established cycle-lane must be continuous, clearly marked and legible so that vehicles weaving left across it know they must yield to cyclists who may be continuing straight ahead. Re-establishment requires that sufficient length is available and that the traffic environment is safe for cyclists, particularly in the case of Collector and Distributor roads. 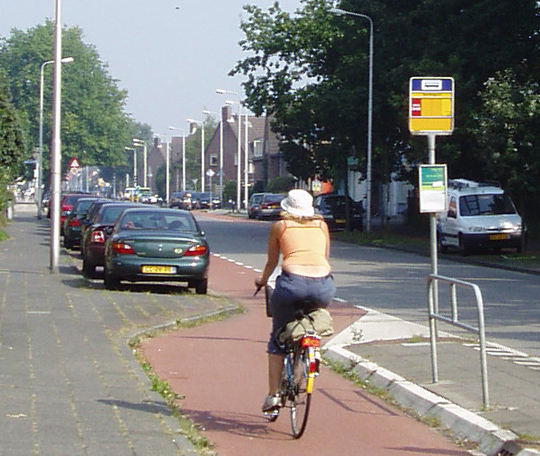 Where the traffic environment precludes the use of a cycle lane, re-establishment can be achieved by means of a raised or similarly segregated cycle track. Cyclists passing on the inside of a traffic queue can frequently find themselves in conflict with right turning traffic coming from the opposing direction to turn into a side road. 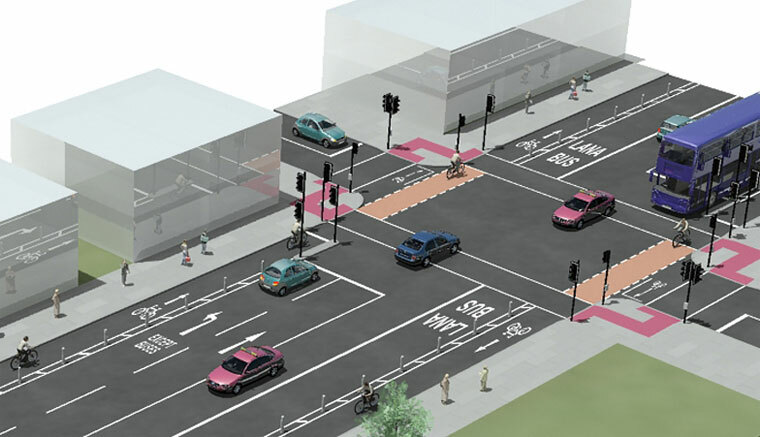 This manual recommends that the cycle lane approaching the junction should be a minimum of 2.0m wide and that the cycle lane is continued through the junction and clearly marked. This will raise driver awareness of the potential for cyclists, improve the visibility of approaching cyclists and maximise the cyclist’s lateral evasion space in the event of a conflict. On busier roads with higher vehicular capacity, multiple and/or dedicated lanes may be required for different movements. 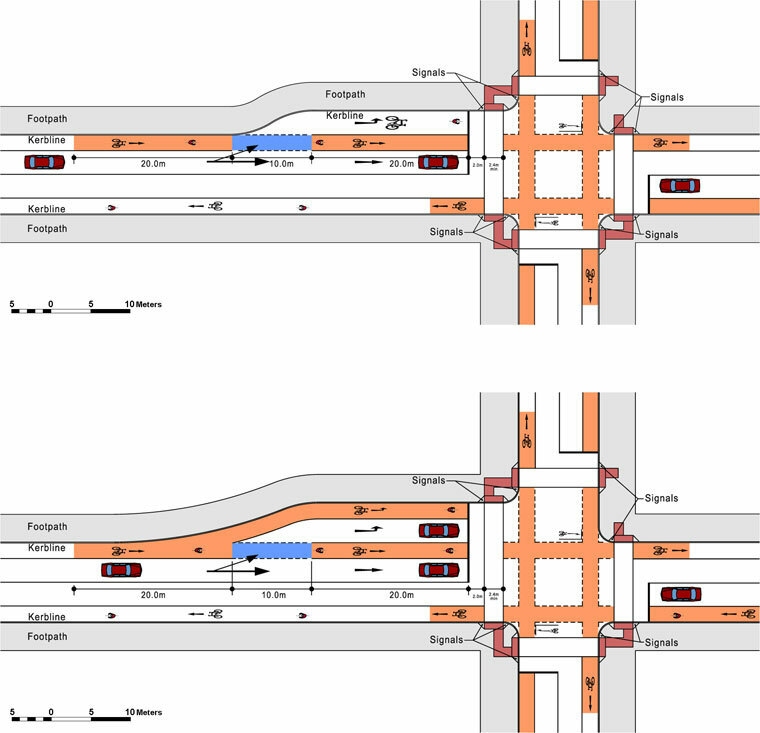 This section looks at left-hand pockets (30.0m or less) and dedicated left-turning lanes (greater than 30.0m) in conjunction with the straight ahead movement. Dedicated right-turning lanes are dealt with below in Right Turns. 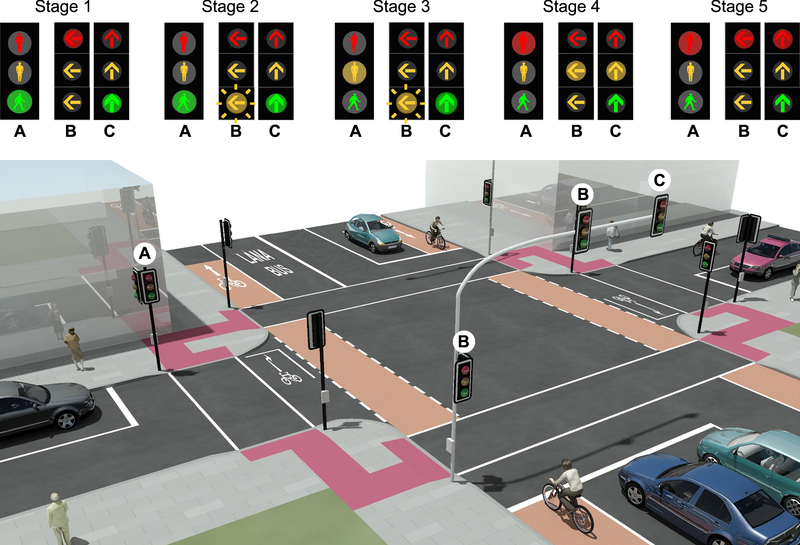 Where a single traffic lane with a kerbside cycle lane approaches a left turn, the straight ahead cycle lane should be continuous through the junction. Left turning motorists are expected to yield to any straight ahead cyclists before turning left. For left pockets and lanes, it is important that cyclists going straight ahead are re-established in their own intended alignment before introducing the turning pocket. 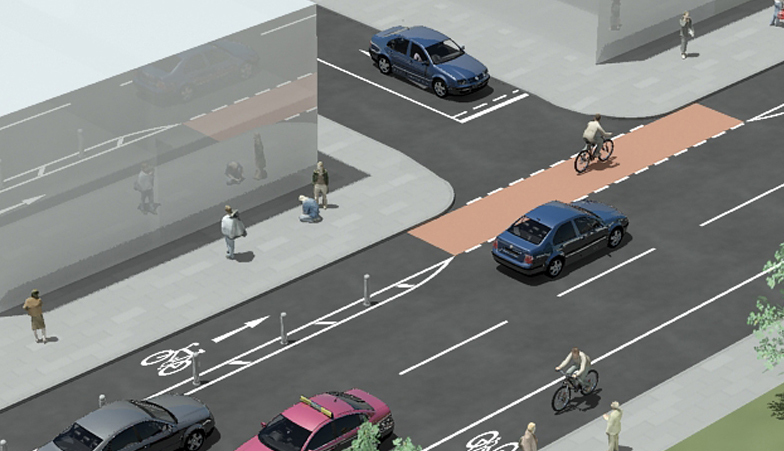 Traffic can then turn into the left hand pocket across the cycle lane. Streaming of cyclists between the left turning and straight ahead traffic lanes is not recommended for distances greater then 30.0m. Where the left turning traffic longer than this is required, the cyclist should be brought to the junction on a kerbside cycle track. 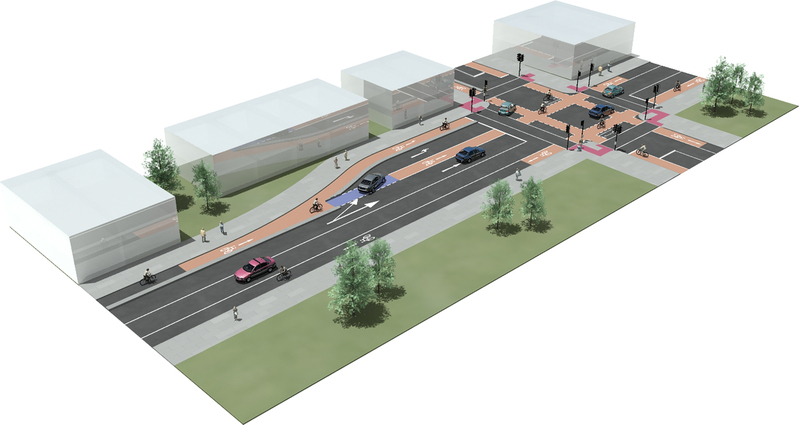 The junction should be signalised and cyclists provided with their own stage. 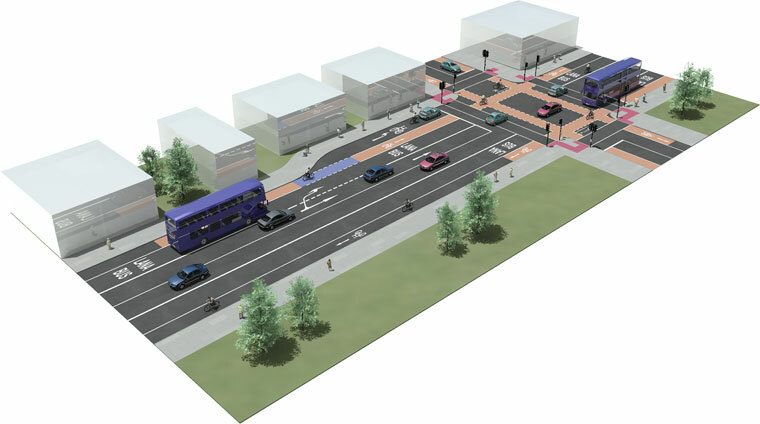 Where a bus lane exists, with a shared or adjacent cycle lane, there is a need to safeguard priority for both buses and cyclists travelling straight through the junction. The layout below provides for cyclists and buses to continue straight ahead in a shared lane, but traffic moving from the general traffic lane must cross the bus/cycle lane to access the left-turn pocket. Put in left hand traffic pocket only if required (e.g. to run as a separately staged traffic movement, facilitate pedestrian crossing of side road, etc.). 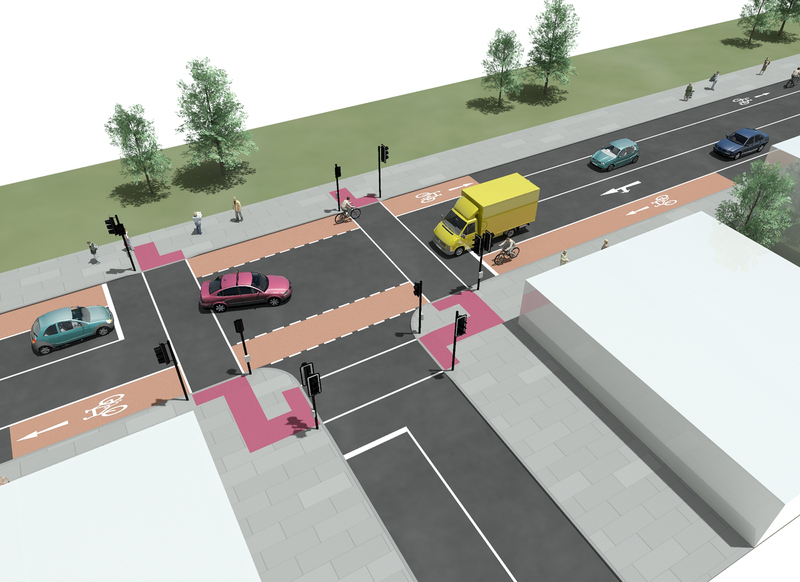 Where a dedicated left-turn lane is to be provided or where there is kerbside parking or loading in advance of the junction, the challenge is to shift cyclists (who are going straight ahead) to the right of the left-turning traffic, without being hit by traffic from behind. 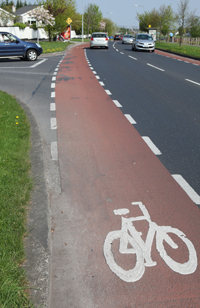 Cyclists should be shifted to the right only under the protection of a physical island. The left turn pocket can be introduced downstream of the island. The geometry of the entrance to the left turn pocket should require “turning” rather than “veering” in order to ensure slow vehicular speed. 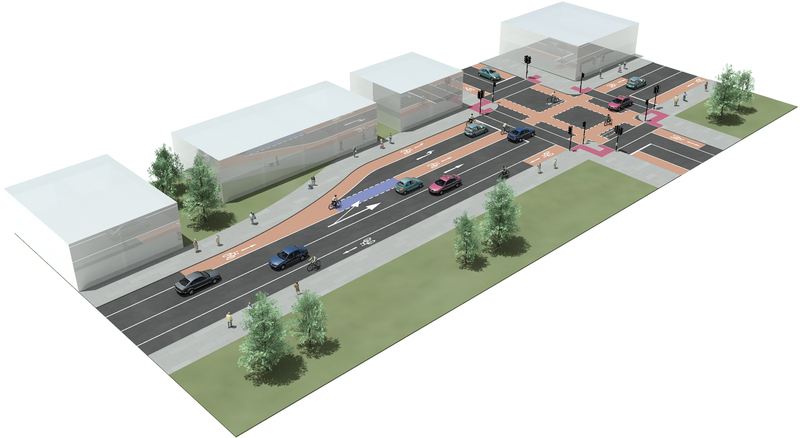 There can be a conflict between pedestrians crossing side roads and significant volumes of left turning traffic. In some urban situations, the solution has been to simply omit the pedestrian crossing. This manual proposes a solution as follows, subject to Department approval, whereby the pedestrian facility can be provided. This will not be suitable where large vehicles (trucks / buses) are turning left. The problem of kerbside cyclists being cut out by a turning vehicle is universal. When that vehicle is a large vehicle, the issue becomes critical. Conflicts between the large turning vehicles and cyclists / pedestrians on left slip lanes present a significant risk. Slip lanes often give drivers an unreasonable sense of priority, and by virtue of their oblique geometry, they restrict views of cyclists and pedestrians. They should be removed wherever possible. A segregated cycle lane along the main road that clearly continues across the mount of the side road is a much safer solution for cyclists. If a slip lane must be maintained, the arrangement shown below in Modifying Existing Left Hand Pockets. Are drivers aware of the cyclists? Are cyclists aware of turning vehicles? Is there an accident history? In addition to a difference in direction, there is a difference in size, but there may also be a difference in speed (e.g. is the cyclist going faster up the inside than the general traffic). 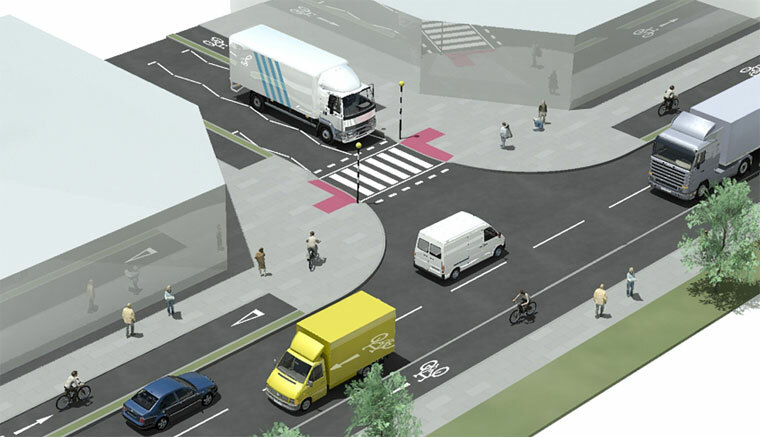 Is the junction one where trucks frequently turn in and out, and needs to be designed with this function in mind? Stage the phase for traffic turning left (flashing amber filter only, no green filter) to follow closure (red) of cyclists and pedestrians phase. Where there is likely to be higher volumes of larger vehicle movements, the following solution, while not as convenient for cyclists, may be safer. What design aspects can reduce the severity of an incident? Left hand pockets should be removed wherever possible. A simple solution is to re-assign the existing pocket as footpath, verge or parking so that the cyclist has the correct alignment. Where a left turning pocket cannot be removed, the layout can be modified to either shift cyclists to the right in advance of the pocket, or to enhance the level of protection for cyclists. 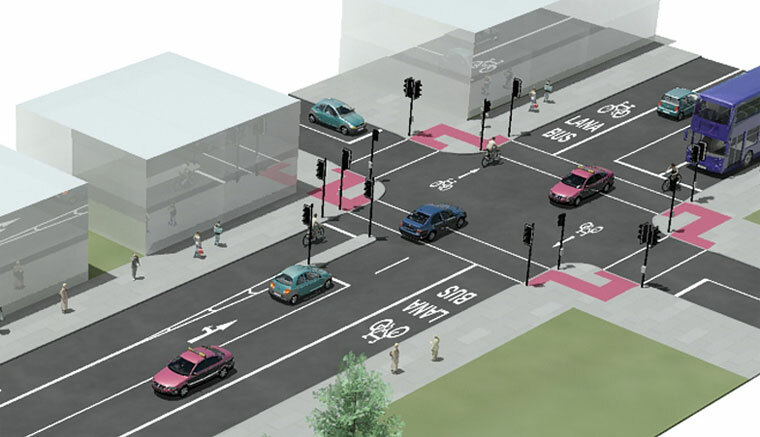 If significant volumes of left-turning traffic preclude the removal of an existing left turning pocket, the kerb should be re-aligned to shift cyclists to the right as shown below. Cyclist is brought to the correct alignment in advance of the pocket with a physical build out. Short section, 30m max, of existing left pocket retained in advance of junction. Where an existing left hand pocket needs to be retained, cyclist safety can be improved by adopting the details shown on the following drawing. Including raised bollards etc. at the end of the left hand cycle track, and at the start of side road cycle track, to keep vehicle from encroaching on cyclist’ space while turning left.